Celebrate Global Smurfs Day - June 22, 2013! Isn't it funny when things come full circle? I remember watching the Smurfs as a kid, and now, I watch the new Smurf movies with my kids. We really enjoyed the Smurf movie with Neil Patrick Harris and I think my kids are going to love Smurfs™ 2 which will be in theaters July 31. If you haven't watched the movie trailer yet, you have to see what the new "naughty" smurfs are all about! 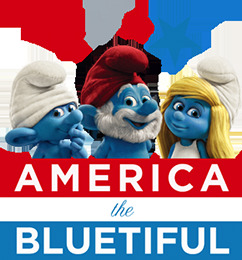 In honor of the Smurfs timeless message of harmony with the environment, the studio is orchestrating a nationwide series of environmental efforts celebrating “America the Bluetiful,” in which kids and their parents can meet the Smurfs as they clean up their local parks, encourage recycling, plant trees, and discover other ways they can help “bluetify” our country. • June 21st - 23rd in San Antonio, TX. Heading to Six Flags this weekend? Celebrate Global Smurfs Day on Saturday, June 22nd 2013! According to the AmericaTheBluetiful.com, if you dress as a Smurf or wear Smurf attire and get early ride time access. If you want to have some Smurf's fun at home, check out the offical Smurf website for videos and kid's games. This website is pretty cool. I can't wait to show it to my kids. Do you have memories of watching the Smurfs as a child like I do? Do you plan on seeing any movies this summer? Image and Video from Sony Pictures. This is not a sponsored post.